Straight up – I am on the Board of Directors for the Roleplaying Game Creators Relief Fund. In great part, we’re there to try and help fellow creators of RPGs get through medical and other disasters that others have insurance to manage. The amazing folks at Onyx Path have decided to launch a rather amazing Bundle of Holding, featuring lots of stuff for their Vampire 20th Anniversary line, that directly supports the RCRF, for which we are all very grateful. And, if you are a V20 fan, you will be too – considering all the amazing stuff you can get for a rather mesmerizing price. Neonate! 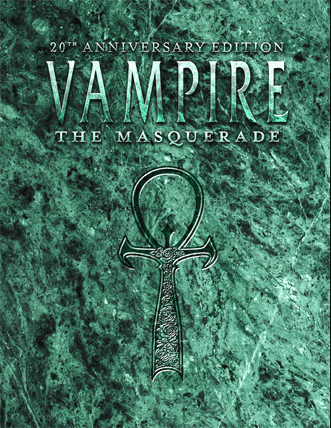 The Camarilla returns to bring you the Vampire 20th Anniversary Bundle, featuring the massive 20th Anniversary Edition (2011) that celebrates the 1991 publication of White Wolf Game Studio’s original tabletop roleplaying game of personal horror, Vampire: the Masquerade. Longtime Vampire fans love this gorgeous full-color 535-page compendium and update of the Storyteller system and the Classic World of Darkness setting. Now get V20 and many recent supplements and adventures in this bargain-priced collection. For just US$14.95 you get all five titles in our Starter Collection (retail value $54) as DRM-free .PDF ebooks, including the complete V20 core rulebook (retail value $30), the V20 Storyteller’s Screen (retail $2) and Companion (retail $10), the adventure Dust to Dust (retail $7), and the newly added V20 Ready-Made Characters (retail $5) with 13 ready-to-play vampires from all the Clans. Dread Names, Red List (retail $15): The throughly updated Kindred Most Wanted Red List of the Camarilla’s deadliest enemies.